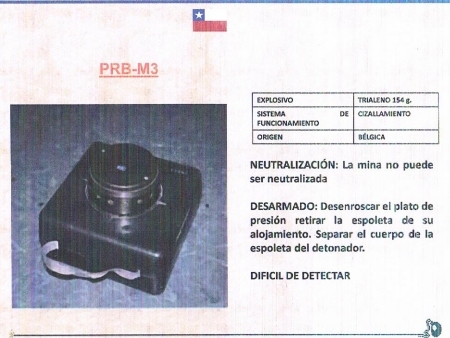 A photo of the kind of landmine discovered near the Pan-American Highway, circulated by local Chilean authorities. The notes say the device "cannot be neutralized" and is "difficult to detect." This week’s closure of the Chile-Peru border was a reminder that the detritus of war takes decades to clean up. An estimated 20,000 people use the Chacalluta pass between Tacna and Arica every day, and when officials discovered that floods had washed up some landmines planted during the Pinochet regime, some 1,400 Chileans and 2,000 Peruvians were stranded on the wrong sides of the border for two days. It isn’t clear how many landmines were discovered, but officials detonated at least four devices found in the vicinity of the Pan-American Highway. The local Intendencia office released photos of two of the kinds of explosives found, both of Belgian origin (see photo above). According to the Landmine and Cluster Munition Monitor http://www.the-monitor.org/custom/index.php/region_profiles/print_profile/242 Chile was, until 1985, a “producer, exporter, importer and use of antipersonnel mines.” The country has signed the international Mine Ban Treaty, but the chart below suggests only about half the mines have been cleared. Here’s a good read: In the Buenos Aires Herald, Chilean political scientist Patricio Navia has an interesting column on the one-year anniversary of Japan’s tsunami after a recent visit to that country. He reports that reconstruction is moving much faster than in Chile, which suffered an earthquake and tsunami two years ago, and observes that the Japanese have more trust in their institutions. Some background is needed here. Municipal elections are scheduled for later this year, and following the uproar over the Krassnoff homage, opponents of Labbe, a retired army colonel and former agent of the Pinochet regime’s security forces, are hoping more than ever that he will not be re-elected. Earlier this month the Chilean press noticed the contents of one of hundreds of declassified documents on the State Department’s Freedom of Information site. In this particular cable, dated August 14, 1987, a former regime official dishes the dirt on Labbe to the U.S. Embassy’s deputy chief of mission. This official is Federico Willoughby, who served as the regime’s first press secretary until health problems forced his departure. But he remained close to Pinochet & Company, until he balked at joining the dictator’s campaign to extend his rule. Willoughby said that Labbe, who had applied for a post at the Chilean Embassy in Washington, had belonged to a small group of army officers providing security for Pinochet in the early days of the regime. This group was later folded into the dictator’s secret police agency, the DINA. More recently Labbe had been part of a unit whose job was “projection of the regime” and to monitor Pinochet’s opponents. Labbe had been sent to an unnamed American university for a course in politics and election management and to gather intelligence on a former DINA agent who had defected to the U.S. One wonders how closely, if at all, U.S. officials were keeping tabs on Labbe. According to Willoughby another reason for sending Labbe back to Washington was his relationship with Jacqueline Pinochet, who had recently given birth to a daughter after splitting from her third husband. The cable notes that Willoughby was being “driven to the wall” by the regime’s pressures on his business clients, that he had one remaining piece of property to mortgage but that he might have to declare bankruptcy. Since its publication last May, my second book, The General’s Slow Retreat, http://www.ucpress.edu/book.php?isbn=9780520266803 has not drawn any interest from newspaper reviewers –until now. And this review comes from Bolivia, by one of that nation’s most respected journalists, Harold Olmos, who has won prizes in his own country and worked for the Associated Press as bureau chief in Venezuela and Brazil. The mass demonstrations in Cairo's Tahrir Square reminded Chileans of their own country's struggle for democracy. A few weeks after the fall of Hosni Mubarak’s government in Egypt last year, two Chileans landed in Cairo. One had been imprisoned and exiled during the seventeen-year rule of General Augusto Pinochet; the other had helped organize a successful campaign against the dictator’s attempt to prolong his rule in a one-man presidential plebiscite. The scenes from Tahrir Square had brought back vivid memories of their own country’s recent history and its transition from dictatorship to democratic government. Sergio Bitar, a founding leader of Chile’s Party for Democracy, and Genaro Arriagada, a Christian Democrat, had held cabinet posts in post-Pinochet governments. The Chileans had made the trip at the behest of the National Democratic Institute (http://www.ndi.org/), one of 17 non-governmental organizations (NGOs) under investigation by Egyptian authorities. The National Democratic Institute had supported voter registration and sent election observers to Chile in 1988, when voters were asked to vote ‘yes’ or ‘no’ to extend Pinochet’s regime for another eight years. Pinochet’s loss at the polls opened the way for free elections, and Chile’s successful democratic transition prompted the NDI to ask Bitar and Arriagada to share their experiences and ideas with Egyptian activists. “Mubarak’s fall from power was very sudden, and Pinochet’s was gradual,” Bitar said in a telephone interview. He noted that Chile’s politicians had been labouring behind the scenes for approximately eight years before Pinochet left the presidency. Another difference was the role of the military: the Chilean army was solidly behind Pinochet, while the Egyptian army proved to be more neutral. The issues of greatest interest to his Egyptian hosts were constitutional reform and corruption, and Bitar said he emphasized the importance of building political coalitions as well as maintaining a dialogue between civilians and the military. He is optimistic about the country’s future democratic prospects, but cautioned that democratic transitions take at least five years. The NDI also hosted a videoconference with Egyptian women activists, with the participation of Maria Eugenia Hirmas, a Chilean sociologist who served in the cabinet of former president Michelle Bachelet. Hirmas gave a presentation on how Chilean women confronted their country’s dictatorship and how they sought to influence post-Pinochet governments. The Egyptian women were interested in the Chileans’ strategies for joining male-dominated political groups, concerned that discussions on constitutional reform and other issues were not taking women’s concerns into account. The Chileans returned to Egypt during last year’s elections as part of a multinational team of observers, with Hirmas and Bitar visiting Alexandria during the vote for a new parliament. Hirmas said many of the women were casting ballots for the first time in their lives, and doing so enthusiastically, including many from impoverished rural backgrounds who reluctantly removed their veils in order to identify themselves to male election officials and be allowed to vote. “I was moved by the hope people had that their situation was going to change, that they had something to say and that this time it would be considered,” she said. An article by Sergio Bitar on parallels between Mubarak and Pinochet in Spain’s El Pais newspaper: http://elpais.com/diario/2011/05/05/opinion/1304546411_850215.html. The Los Angeles Times has an admiring review of Chilenazo (www.chilenazo.net) , a Chilean restaurant in Canoga Park, with a mouth-watering description of pastel de choclo: http://www.latimes.com/features/food/la-fo-find-20120202,0,3541039.story. Whenever I come to you — this was the third time — I always feel as if I am sneaking into a special place, hidden behind a secret panel. You are the longest and thinnest country on the globe, topped by the fire of the world’s driest desert, your feet in the ice of glaciers and Antarctica. The impenetrable Andes are your eastern spine and your west is wetter than wet, a nearly unbroken expanse across the vast Pacific. You veil yourself so from the rest of the world, tucked away, unique and quiet. You are extraordinary. I came for your wines, of course, to discover more about them. I had not seen you in 10 years; much had changed — but also much had not. I will be blunt. Chile, you need to begin to tell a better and fresher story about your wines. Chilean filmmakers have won not one, but two prizes at the Sundance Film Festival, with “Violeta se fue a los cielos” (Violeta went to Heaven) http://filmguide.sundance.org/film/120056/violeta_went_to_heaven receiving the prize for the World Cinema Grand Jury Prize and “Young &Wild” awarded with World Cinema Screenwriting Award for drama http://filmguide.sundance.org/film/120026/young_wild.